Yesterday was nice. Cold, but at least it was under blue skies and sun. I’ll get to that in a bit. Though Wednesday in Falmouth had nothing to do with cycling, it would be such a waste to let the photos languish, unseen, on my computer. Since the driving force behind my trip to the gorgeous Cornwall area was trike related, I’m going to share. After all, I did the same thing with our trip to Nordkapp and the trike was never pulled out of the car. That gorgeous, stark part of Norway is crossed by the Sverigeleden though. Though forecasts had said it was going to be nicer in Falmouth on Wednesday (October 24th), it proved a lie. The clouds looked as if they were going to break up, but then thickened and another fog rolled in. It wasn’t nearly as thick as Tuesday’s, but still had that wet mugginess. I toyed with the idea of going to ICE any way, but the trip down and back up the stairs for breakfast told me I’d be lucky to make it a quarter up my first hill. My 3.68 mile ride which was pure up and down had left my legs aching and weak. I guess to cycle in Cornwall, I need to practice by climbing Everest. I e-mailed my regrets and thanks for their hospitality. In spite of the weather and wobbly, muscle-aching legs, I didn’t want to spend the day penned in my room either. After a bit of checking found the castle on a peninsula just 2.5-ish miles there and back, I decided to go for a walk. After all, less than 2 weeks ago, I’d taken a 4+ mile walk with no more than a little muscle soreness. So, with my Five Finger shoes stuffed into a backpack off I went. Less than 300 yards from Trelawney Guest House, I ambled up the first steep slope which took me along a cliff edge to overlook the harbor. The views in clear weather must be stunning because what little I could see through the murky morning was pretty. I longed for my trusty Canon as I went. Jens’ little digital point-n-click is good, but just can’t beat an SLR though the low light and fog might have made getting clear pictures a little tricky. Or at least with auto-settings. I really should learn to use the manual functions on day. I keep saying that, don’t I? But the Canon had to stay home since there simply was no room for it in my limited luggage space if I wanted to avoid checking anything in. I walked slowly in hopes of sparing the more fragile parts of my physique and strolled up yet more hills. Others were out. Joggers and walkers were out in spite of the gray. Then I reached a turn for what I think was for the castle. Right across from it was the beginning of a footpath. I waffled for a bit before deciding to save the castle for last expecting there’d be another way up on the other side. The path followed along coast just below the road some 15-25 feet higher. Trees and thickets gave occasional glimpses of the sea and mist-veiled bits of land. I could hear the surf on the shore edge out of sight below the steep drop and the cry of sea birds carried on the heavy air. The camera didn’t do the clear, pale blue water justice. Maybe a little more than half a mile from the B&B, I felt the first twinge in my ankle. 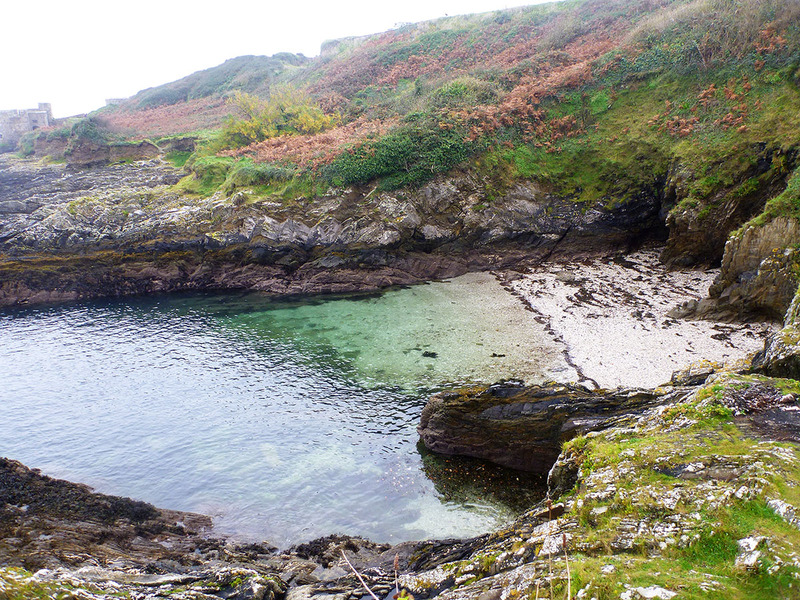 It gave me pause for consideration while staring down into one of the gorgeous little hidden coves that stud the rocky shoreline like diamonds. Not wanting to return to languish at the B&B with my Kindle for my last day in Falmouth, I found a marginally less soggy spot to sit, swapping my battered sneakers for my Five Fingers. Wiggling my toes and doing a small circle, my ankle felt fine. My old shoes were muddy, so I just carried them by the laces as I went on. The views closed in, screened by trees and undergrowth. Voice drifted from the downward sloping path and a flash of white was all the warning I had before a very happy and very wet little dog ran up to jump against my legs in a cheerful demand for attention. Her owners apologized profusely as I gave her the petting she had soaked me down for. The man asked me curiously about my ‘toe shoes’ before they walked on. I’d forgotten how clear the water was in that part of England. Clear as crystal and with that aquamarine gem-stone blue that reminds me of the tropics. With the clouds and mist, it was only possible to see that when looking down at the beach. Just a little bit after meeting the family, I came to some short of defensive construction. I suppose it might be a ruin and parts of it might be quite old, but parts of it looked no older than WWII. There weren’t any signs for it. Standing at the edge of a sheer drop on one end of the wall in those ‘ruins’, I found another pretty cove and further out an old defensive tower right at the water line. You can see part of the tower in the upper left of the above image. My steps went a little faster, eager and curious as I was about the tower. The path looked steep, but my legs and ankles felt fine. The trail made a split going up to the parking lot and continuing on to the old tower. Up on the parking lot, an information sign was clearly visible. Since it was close, I went up the hill to it. I really should go look at the really interesting things first. Why? As soon as I stepped off packed dirt studded with rocks or softer grass onto the pavement of the lot, the ankle which had given it’s first twinge a mile earlier locked up. The only description I have for it is it feels as if the tendons seize tight. I could stand with the foot in the neutral position under me, but as soon as the ankle had to flex for that foot to take the back position of a step, I saw stars. It couldn’t flex much to take the lead position of a step either. It used to happen a lot. It seems to occur less now, maybe because I don’t walk so much, preferring to ride my trike when I can. It has little to do with my weight. When it happened frequently (a couple times a week or more), I was a dainty little thing of less than 110 lbs who walked everywhere and went hiking for miles. Couldn’t get much skinnier without being skeletal. The closest bench was about 100 feet away. I inched along toward the sign instead and sat down on the curb ringing the parking lot where I managed to work the foot from side to side a little. Finally it loosened somewhat and I immediately stepped on the grass. That helped a little more. The tower was down the slope on the rocks at the water’s edge. Though curiosity pulled hard for me to go take a peek inside since there was no gate over the doorway, I decided I should limp on toward the B&B. The parking lot marked roughly the halfway point around the headland, so continued onward rather than double back. The footpath ran below the edge of the parking lot. Parts of it were quite narrow, bracketed on either side by blackberry canes of all things. In places, the wall of thorns rose well above my head. Much to my surprise, there were even berries. Some red with the need to ripen and others of beautiful glossy purple-black that just begged to be plucked and savored. They made quite a nice snack as I went. The footpath ended on the far side of the parking lot. My speed was highly variable once I was forced to take the sidewalk. My ankle would feel fine for some distance and then abruptly lock tight again. At one of the benches along the sidewalk, I stopped to change back to my sneakers in hope of a little relief. After all, my ankle didn’t twinge with the sneakers until I was dealing with the natural surfaces of the footpath. Nor did I have any problems while wearing my Five Fingers until I tried walking on pavement. The results of the shoe change were mixed. The ankle seemed to lock up less for shorter periods. As I followed the coastline northwest, I was disappointed to discover there was no way to the castle from that side. At least, no way I could manage. 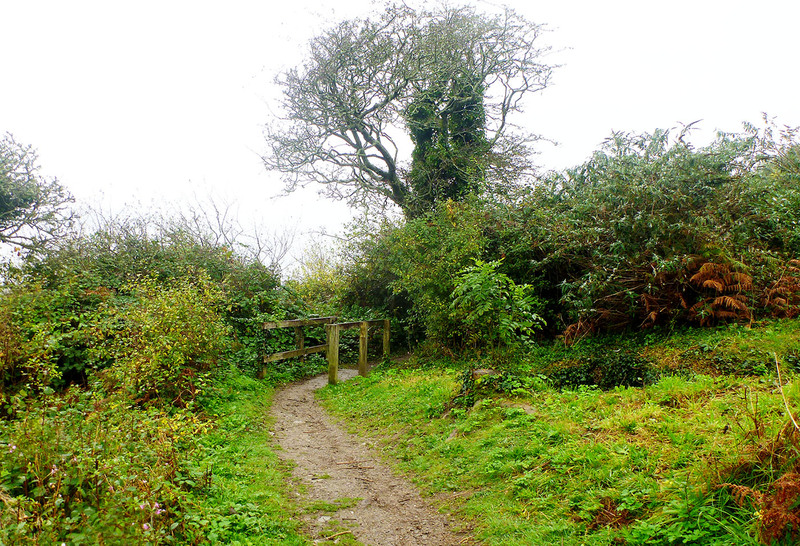 There were foot paths that wended up the steep, craggy hill. My determination to explore was not quite strong enough to overcome my commonsense that much with my crappy ankle. If I’d been problem free, I’d have been testing my knees for those climbs. After a few more hills, I completed the loop and came back around to the road which would take me toward the turn with the castle. I considered it as some time had passed since the last lock-up. By that point though, my legs felt like they were made of wet noodles. I looked up that steep slope as it began to rain while keeping in mind I already had to climb another, if lesser hill back to the B&B. Regretfully, I turned back toward ‘home’. The time it took for the roughly 3 mile walk was amazingly short, less than 2 hours. Given how slow I went even when not slogging up hills, taking photos or just admiring scenery, I was stunned. Disappointment weighed heavy as I spent most of the rest of the day reading in my room except for the half an hour soak in the bath for my ankle. Around 4 pm, I felt well enough to go in search of fish and chips for supper. The ankle twinged once or twice, but thankfully it remained relatively flexible. The next morning was the return trip to London for my 8:15 flight home. On the little bus-like train between Falmouth and Truro, I talked with a very nice English woman who had family in Sweden and an absolute passion for the country I now call home. 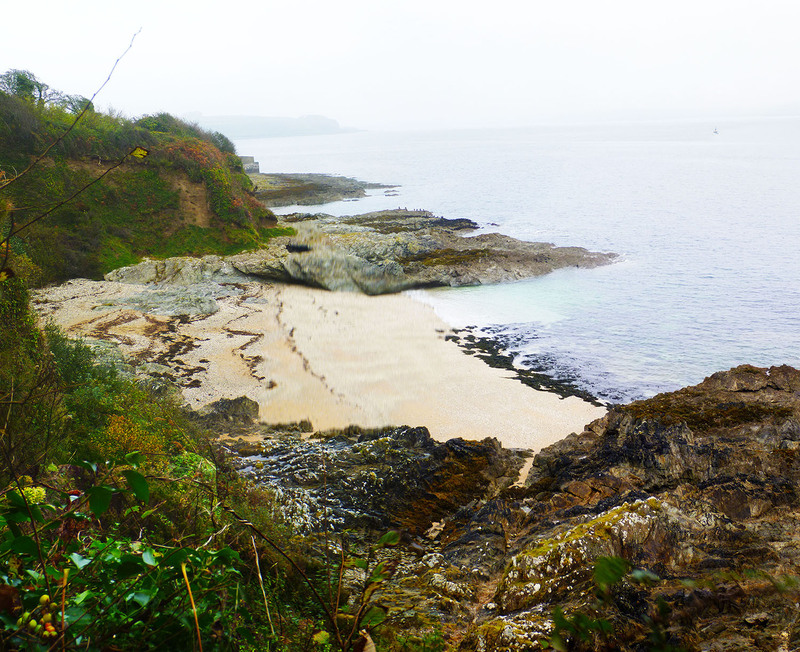 Annoyingly, the sun actually came out as Falmouth disappeared behind me. Seemed I was always leaving the sun. The train ride between Truor and London went quietly. I took a couple pictures through the train window, but the reflections annoyed me. About an hour outside of London, the sun was gone again, lost behind the gray blanket of clouds. The rest of the trip continued in tedium. Getting through security at the airport was aggravating and then followed by a 5 hour wait. Better that than killing myself at a dead run to make a 15 minute deadline across an airport. Some delays. The flight was more of the same. I shuffled through the passport check in frosty Sweden at just before 1 am. The temperatures had been well above freezing when I left, but I returned to nights with moderate freezes and frosts and days inching up to about 36 F. Stockholm had even received a dusting of snow which had quickly melted. It felt good to be back and to see my red-haired hubby waiting. He had a bit of bad news though. Loke had been furiously licking his paw on the drive to the airport. Though all I wanted to do was fall into bed when we arrived home, I forced myself to stay awake long enough to check. Obviously the infection had returned to the skin between his footpads. I pulled out the iodine mix and the left over ointment to tend it. At least it’s been caught before Loke gave even the first limp. The skin was quite red and looked a little ‘wet’ from the beginnings of ooze, but no wound. When I went to take the fuzzy one for a rolling walk since Jens was buried under work, Loke was having none of the ‘walking’ part of our outing. He bounced and yodeled at the end of the tether and then threw his weight against the harness with his paws scrabbling madly for purchase to drag furiously against the brakes. After a few minutes of that and more kangaroo hopping, I decided it was more damaging for his paws to be scraping pavement like that then it would be to run and I let him go. And the weather was pretty! First time I’ve been out doing something in the sunshine for almost 2 weeks thanks to the persistent gray and drizzle we’ve had lately! Clear blue skies with a playfully brisk wind that whirled the leaves in graceful circles like the ballroom skirt of a waltzing woman. It was cold, but I’d pulled on my heavy wool and gloves. Jens didn’t give me time to find my shoe covers though. It was my toes, aching from the cold, that cut the ride short at 5.06 miles. Otherwise, I would have pushed it closer to 9 or 10 miles by adding every little extension or mini-loop possible to the River Loop. Hmmm. Today is as pretty, though colder. Maybe I should go hunting for my shoe-covers and take Loke out again today. I’m feeling a bit motivated to do so since another 5 miles or so will tip my year’s total mileage over 700 miles! This is the best mileage I’ve done in a year since 691 miles in 2009. My best ever was 1303 miles in 2008. I’ll easily push over 700 miles since we have another 2 months and I’m right around 695 miles. Loke may even beat his best. He’s a bit behind me though with 601 miles. 657 miles is his best year total. We’ll see. 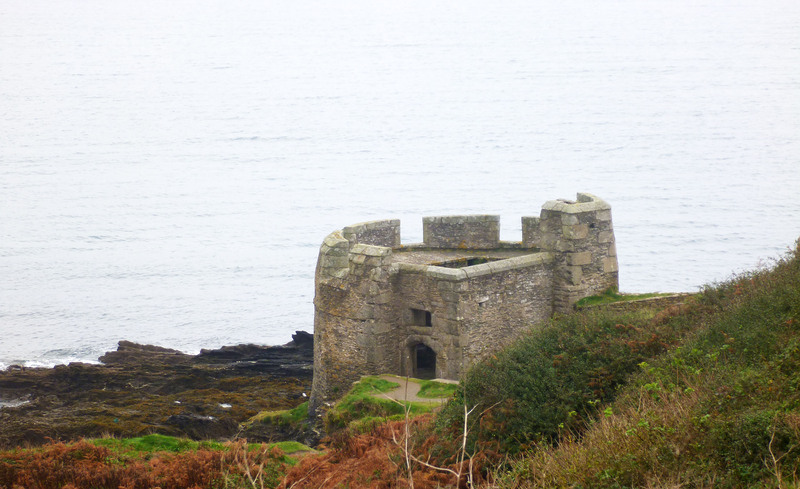 I enjoyed the pictures and description of the area near Falmouth. Thanks! I certainly tried because it really was beautiful in spite of the fog and misty rain.